I started off my resolution for February to eat more healthily while spending less by doing a stock take. I take a very high tech approach – pottering around our kitchen with a pen and paper, making a list of the food in the house. 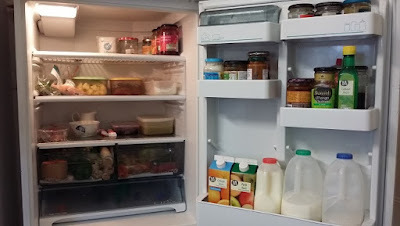 Everything came out of the assorted cupboards, fridge and freezer, shelf by shelf or drawer by drawer. I even (shock horror) had a go at cleaning the surfaces before putting everything back. I’d never get round to this every week, but from time to time it helps remind me what we have available, and what really needs using up. 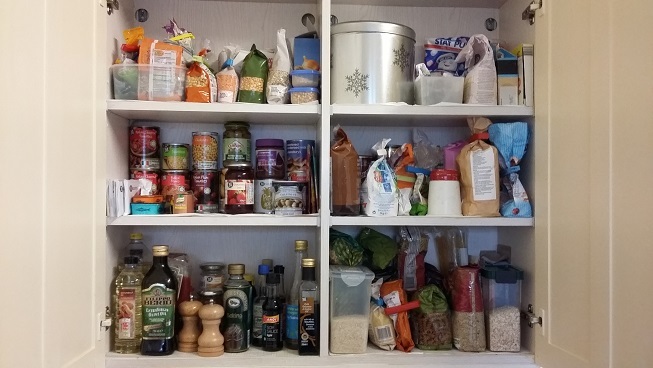 This is our main store cupboard, with pulses and dry stuff top left and rarely used baking stuff top right. 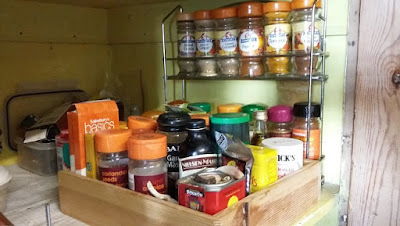 The middle shelves hold tins and jars on the left and assorted flour and sugar on the right. On the lowest level are the oils, vinegars and other flavouring, with carbs like rice, pasta and noodles on the right. Although we still have quite a lot of store cupboardingredients, we’re running out of a lot of fresh stuff. 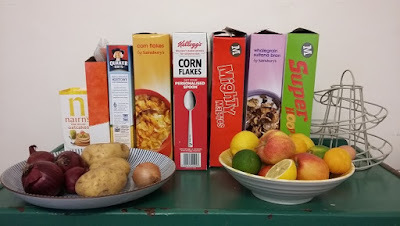 We keep cereal handy on the top of our green cupboard, and there’s only a few onions, potatoes and apples left, and a single egg lurking behind the lemons and limes. 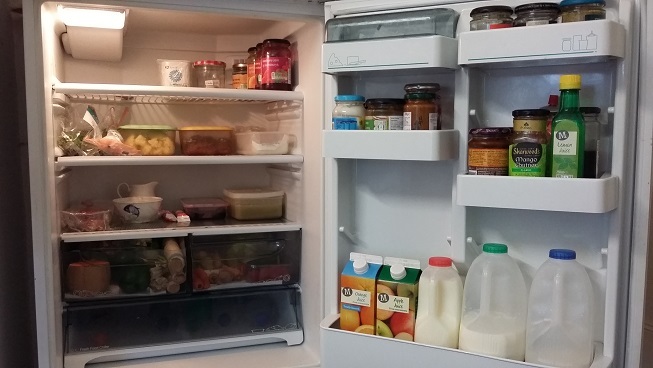 Similarly the big fridge has quite a lot of space on its shelves, with limited fresh stuff left. There’s a couple of boxes of leftover mash and beef stew ready for my husband to take into work for lunch, and another box of soup for my lunch. 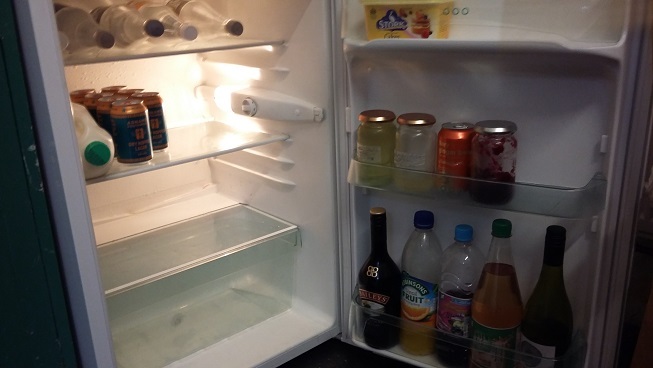 The small fridge is virtually empty apart from assorted drinks, although it was packed ready for all the visitors over Christmas. We’ve got a certain amount of protein in the freezer that needs using up, but otherwise it’s pretty sparse. 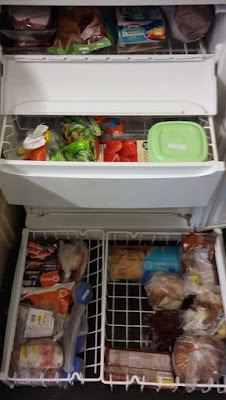 drawer for protein, one for bread stuff, one for frozen fruit and veg, and the flappy compartment at the top has processed food like fishfingers, ice cream and puff pastry. 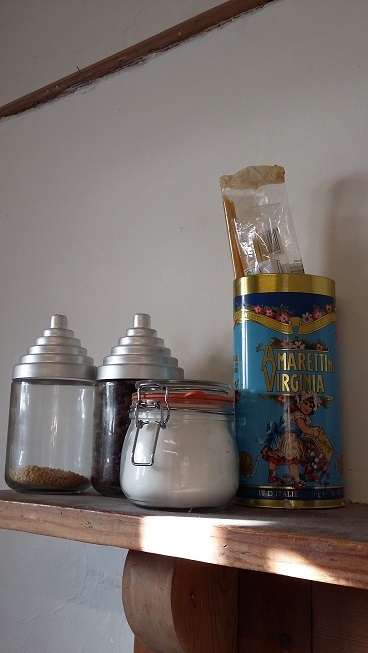 Nearly forgot a few stores lurking on the mantelpiece – last of the giant cous cous, raisins, vanilla sugar and elderly spaghetti. Here’s a photo of the mug cupboard above the kettle, where we keep all the tea bags, coffee and hot chocolate. We’ve got a good supply right now, so it’ll be interesting to see how long it last during February. Finally, this is a particularly unglamorous cupboard next to the Aga, where I keep things like herbs, spices and stock cubes. I reckon adding flavours like these can make a massive difference when cooking on a budget. refilled time and again. You can see more recent versions from Sainsbury’s in the wooden box! Think the only other food we have is a few kit kats and a couple of Fruit Shoots, hidden away as post-swimming snacks for the children. Since the June store cupboard challenge, when I made a big attempt to use up weird and wonderful ingredients that had been hiding at the back of cupboards, I no longer have quite so many oddities hanging around. However, there are still a few things that I keep pushing to one side, and could do with using up. 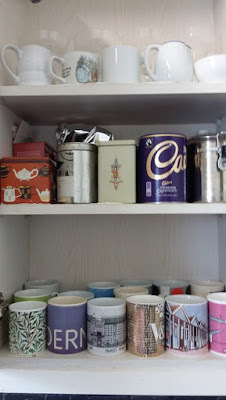 As I could still do with losing some lbs as well as saving £s, I suspect the trio of condensed milk, black treacle and chocolate spread may yet stick around in the store cupboard. Off to look up recipes and start meal planning! I feel soups coming on, with all the stock, iffy rice, split peas, parsnips and celeriac! Do you have a butcher or farm shop near you that sells ham hocks? I think they're effectively the pigs ankle, so not huge. The smart farm shop near us sells them for a couple of pounds each, smoked or unsmoked, and they're great to flavour either a big pan of beans or to boil like ham and then use the resulting stock (or some of it if it's very salty) to make yellow split pea soup. I like split pea soup anyway, but it is very good with anything pork-related. Ham hock sounds like a great suggestion, and a good reason to have a chat with our local butcher, thank you! You've got a really good selection of foods there, with a few regular purchases of fresh things to compliment your stores you should be fine for February. I look forward to following your progress. Have you tried using your tin of potatoes for the very fashionable 'crushed potatoes' Simply drain, warm them through in a small amount of fresh water until they are a little softer and then drain again, and let all the steam escape, then lightly crush with a fork or masher. Add a few dollops (technical term) of butter a grind of fresh black pepper and sea salt – absolutely delicious. Crushed potatoes sound fun, especially after attempting the crushed celeriac yesterday. The other thing I'd thought of was using the potatoes in a curry, in the hope the spices might overcome some of the tinned taste.